METHODS: We conducted a multicenter, randomized, double-blind, placebo-controlled trial involving 18,924 patients who had an acute coronary syndrome 1 to 12 months earlier, had a low-density lipoprotein (LDL) cholesterol level of at least 70 mg per deciliter (1.8 mmol per liter), a non-high-density lipoprotein cholesterol level of at least 100 mg per deciliter (2.6 mmol per liter), or an apolipoprotein B level of at least 80 mg per deciliter, and were receiving statin therapy at a high-intensity dose or at the maximum tolerated dose. Patients were randomly assigned to receive alirocumab subcutaneously at a dose of 75 mg (9462 patients) or matching placebo (9462 patients) every 2 weeks. The dose of alirocumab was adjusted under blinded conditions to target an LDL cholesterol level of 25 to 50 mg per deciliter (0.6 to 1.3 mmol per liter). The primary end point was a composite of death from coronary heart disease, nonfatal myocardial infarction, fatal or nonfatal ischemic stroke, or unstable angina requiring hospitalization. RESULTS: The median duration of follow-up was 2.8 years. 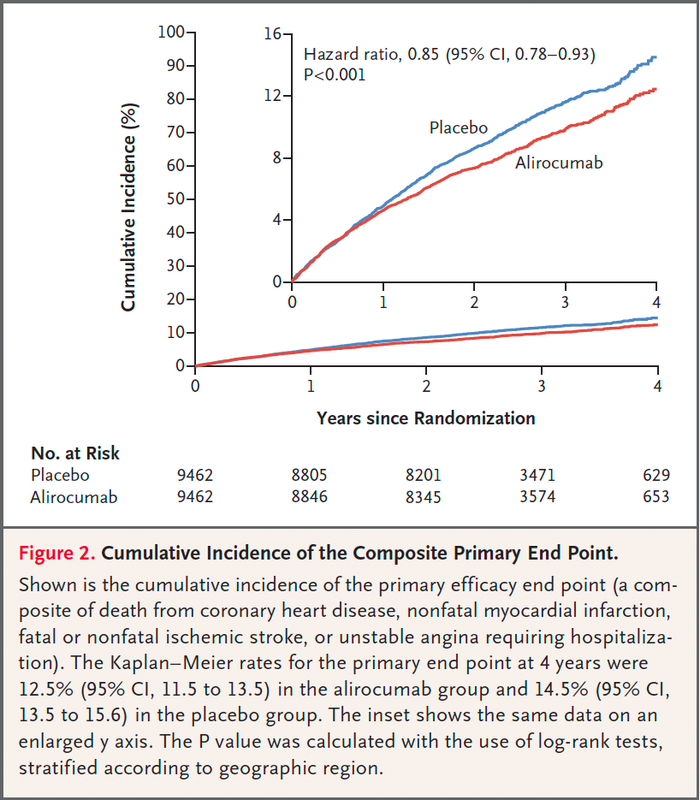 A composite primary end-point event occurred in 903 patients (9.5%) in the alirocumab group and in 1052 patients (11.1%) in the placebo group (hazard ratio, 0.85; 95% confidence interval [CI], 0.78 to 0.93; P<0.001). A total of 334 patients (3.5%) in the alirocumab group and 392 patients (4.1%) in the placebo group died (hazard ratio, 0.85; 95% CI, 0.73 to 0.98). The absolute benefit of alirocumab with respect to the composite primary end point was greater among patients who had a baseline LDL cholesterol level of 100 mg or more per deciliter than among patients who had a lower baseline level. The incidence of adverse events was similar in the two groups, with the exception of local injection-site reactions (3.8% in the alirocumab group vs. 2.1% in the placebo group). CONCLUSIONS: Among patients who had a previous acute coronary syndrome and who were receiving high-intensity statin therapy, the risk of recurrent ischemic cardiovascular events was lower among those who received alirocumab than among those who received placebo. (Funded by Sanofi and Regeneron Pharmaceuticals; ODYSSEY OUTCOMES ClinicalTrials.gov number, NCT01663402 . ).